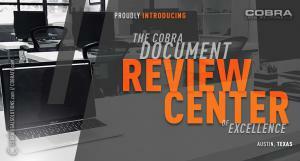 AUSTIN, TX, UNITED STATES, October 30, 2018 /EINPresswire.com/ -- Cobra Legal Solutions, a leading global provider of technology and legal support services, is proud to announce the opening of its Document Review Center of Excellence in Austin, Texas. The new center, conveniently located close to the heart of downtown Austin, further expands Cobra's global footprint. Cobra has responded to the growing demand for accurate and efficient domestic review from its clients with a state-of-the-art facility complete with CCTV cameras, biometric access and ISO 9001 and 27001 compliant systems and infrastructure. In addition to the Austin facility, Cobra also maintains operations in Boise, New York City, Knoxville, Denver, Portland with data centers in Austin and Chicago along with a managed review facility and data center in Chennai, India. Cobra empowers corporations and law firms by providing experienced and highly-skilled professionals, ISO certified processes, and industry-leading technologies to revolutionize the delivery of legal, information, and technology management services and support strategies. Decades of expertise in litigation, technology and information management services equips Cobra with the unique ability to propose agile and strategic solutions that respond to client’s current requirements and foresee future challenges. More information is available at www.cobralegalsolutions.com | www.cobratx.com.